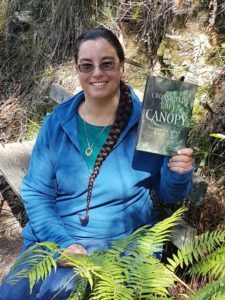 An hour-long conversation with Thoraiya Dyer, Aurealis and Ditmar Award-winning Australian science fiction and fantasy writer and veterinarian, author of the Titan’s Forest fantasy trilogy, published by Tor Books: Crossroads of Canopy, Echoes of Understorey, and Tides of the Titans. Thoraiya Dyer is a four-time Aurealis Award-winning, three-time Ditmar Award-winning, Australian science fiction writer and veterinarian. A graduate of Sydney University and resident of the beautiful Blue Mountains, her work has appeared in Clarkesworld, Apex, Cosmos, Analog and various US and Australian anthologies, including Bridging Infinity, edited by Jonathan Strahan and published by Solaris. Four of her original short stories are collected in Asymmetry, available from Twelfth Planet Press. Dyer is represented by the Ethan Ellenberg Literary Agency. She is a member of SFWA. 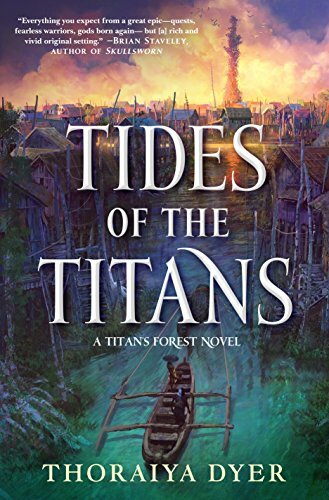 Her Titan’s Forest big fat fantasy trilogy, comprising Crossroads of Canopy, Echoes of Understorey, and Tides of the Titans, set in a massive, magical rainforest, is published by Tor. You can listen to a short story set in the same world, “The Chimney-Borer and the Tanner,” at Podcastle.org. In addition to books, her other great loves are the environment, bushwalking, archery, and travel. Thoraiya, welcome to The Worldshapers. I always like to figure out the connections that I have with authors. There always seems to be something. A lot of them I met at a science fiction convention in Calgary, but not you. Our only connection I could find is that we share an agency, the Ethan Ellenberg Agency. But we’ve never met. No, but we have the Canadian connection as well. My grandparents, Australian grandparents, set off on a trip around the world to teach in as many countries as they could, and they sort of got stuck in Canada for twenty-five years. So, my mother spent her formative years in Canada and my uncle is on Vancouver Island. Hi, Uncle Wayne! So, I feel like we have that as well. Oh, yes, I guess we do. Now, we’re going to talk about your Titan’s Forestbooks in the course of this, but whenever I get started I always like to take my guests back into the mists of time. How did you become interested, first of all in science fiction/fantasy, and then in writing. Did that happen at the same time, were they separate things? How did that all happen for you? Totally did, totally did at the same time. I think all kids love getting lost in worlds of the imagination, so the more pertinent question is, why do some of them stop reading science fiction or stop enjoying those sorts of stories? I was very lucky that my mom was a science fiction and fantasy fan. She had so many paperbacks from the ’50s onwards, but also sort of child-friendly ones like Asimov’s robot stories and The Flight to the Mushroom Planet. Don’t know if you remember that one. I remember the title. I don’t think I ever read it. So good. It’s about a couple of kids who answer this ad in the newspaper for someone wanted to volunteer to fly the spaceship. And it’s, you know, it’s so good. And then, you know, fantasy-wise, Enid Blyton, and The Jungle Bookand The Neverending Story were all there. Yeah, I loved those right off the bat. Enid Blyton is a name that I don’t think anybody else has mentioned yet, but I actually know her work because when I was in university I lived with a family in Edinburgh for a little while and they had all these Enid Blyton books, The Famous Fivebooks, and I read my way through those even though I was, like, eighteen, because there was nothing else in the house to read. Well, did you read The Magic Faraway Tree? No, no, I didn’t read that one. So, when did you start trying to write? Well, I guess you could say that the first science fiction story I wrote was a year in third grade. I wrote what could be called Star Warsfan fiction. We had this task where we were supposed to be writing about a haunted house and completely subliminally I ended up writing about the hero escaping by throwing a skull at the door mechanism, not unlike Luke escaping the rancor pit. And, yeah, that went on, too. I had to read that in front of the class because I got great marks for it and then all the little boys are piping up with, “Hey, doesn’t that happen in Star Wars?” and I was like, “Sh! Sh! No, it totally doesn’t.” But, yeah, I always loved writing, and then after I finished Year 12 but before I started vet school I was writing and submitting short stories to Australian markets, but I didn’t get any acceptances, so off to vet school I went and then I didn’t try again seriously until I was pregnant with my daughter and I had to leave the veterinary workplace because of the X-rays and the anesthetics and the hormones and things and I didn’t want my daughter to end up with two heads. So I found myself at home and thought, “It’s time to give this a serious go.” And that’s when I did get my first short stories published and was embraced by the Australian science fiction community and I discovered conventions and the rest is history. All those years when you weren’t publishing, did you take classes or workshops or did you have a writing group that you belonged to any of that stuff, or were you kind of forging your own path all by yourself? I didn’t belong to a writing group. Australia is large and I wasn’t on social media. But I did go to various writers’ festivals, which they sort of have in the capital cities. The Brisbane one in particular, like the Sydney Writers Festival, is very literary. I don’t know what it’s like in Saskatchewan, but you know they love poetry and things in Newcastle, where I was living, so there wasn’t much of a genre focus. But Brisbane, which is like 1,200 kilometres away from where I was living, had invited Jim Frenkel from Tor to teach one of their workshops. That was just right after my daughter was born and I got good value from that, but that was the exception rather than the rule. Well, actually, Saskatchewan is similar—and, by the way, kudos for pronouncing Saskatchewan correctly. The funniest one I ever heard was, we were traveling and some kid looked at our license plate said “Sask-at-CHEW-an? Where’s that?” So, that was very impressive. But, yeah, it’s much the same, I mean, it’s a big empty space. We have a very strong Writers’ Guild here in the province, but not a lot of genre focus, especially not when I was growing up. Actually, I’m the guy that writes the science fiction/fantasy column for their newsletter, so there’s so a bit more of it now than there was when I was a kid. Yeah. So, what was your first published fiction? My first published short story was in an Australian magazine called Andromeda Spaceways In-Flight Magazine. I’m trying to think what was the title of the story…oh, I should have done some research on my own website before coming on this podcast. Well, you’ve had a lot of stories published. Yeah. So, it’s a really good format when you submit to them. They have this process so it’s a rotating roster of editors so that nobody gets too tired and burnt out, and they give really good personalized feedback, and that’s all I was after at the time, but the story was published, and then it was shortlisted for an Aurealis Award, which is the Australian juried speculative fiction award, which I had heard of by seeing the stickers on the cover of Sean Williams’s novels—I don’t know if you’re familiar with Sean Williams? But, by going to that presentation ceremony I met some of the movers and shakers of Australian small press. Pretty amazing, because when I was doing all that submitting before it was printing out manuscripts and pasting them to the United States and footing these massive sums of postage bills, which luckily, thanks to the wonder of e-submissions, don’t exist anymore. But it was costing me a hundred dollars each time I submitted! Yeah. So, after that I wrote a lot of short stories. I had the goal to take sort of baby steps upward. I wanted to get, like, the semi-pro sale and then my pro sale. I had my Locus Magazineand Duotropeto give me the list of all the markets and I knew what I loved reading and I was submitting to those. I was so excited to be accepted byClarkesworldand Analog. Still haven’t cracked Asimov’sbut I’m gonna to keep trying. So that was all good practice in not taking it too hard when you get rejected, which stood me in good stead for novel submissions. One thing I found interesting is that you write both science fiction and fantasy, and some authors I talk to do that, but others specialize in one or the other. Do you find it easy to move back and forth between the genres? I do, and I love…there’s a different focus with each one. I feel like with the science fiction there’s that moment of understanding where you realise that something is possible that you never thought was possible before, or you see some kind of scientific concept which was just numbers and letters on a page, suddenly the meaning it all unfolds, and I love that moment of discovery. Whereas, I think with fantasy, with magic, it’s less about understanding how things work and more about just feeling really intense feelings. Probably that children get to feel more when they don’t know the limitations of possibilities. I guess, I’m thinking about, you know, it’s Christmas time and I’ve just had the chat with my daughter that, you know, she’s just working at that’s Santa’s not real and I always thought to myself, you know, I’m never going to tell her straight out that there’s no Santa unless she comes to me with a question and then I’ll answer it honestly. So, she’s come with me to me with a question and I’ve said, “Look, no, there isn’t a Santa,” and there’s just the sadness of that being taken away. I think fantasy lets you live in the realm of infinite possibilities and that’s just so wonderful. And, you know, my hobbies of archery and loving to be in nature, they all go towards what I write on the fantasy side, whereas the veterinary science and reading the journals and staying on top of sort of current discoveries, that all goes into the science fiction side. What drew you into veterinary medicine? I love animals. I wanted to be a zoo vet. Always was interested in saving endangered animals from extinction, and then worked so hard to get into it, it’s a very competitive course here, and then on the first day of my very first lectures we had a zoo vet come in and address the class, and he was like, “Well, here’s how it is. You know, we’ve got five zoos and there’s like three zoo vets in the whole country and if you want to get one of these coveted positions, the best thing you can do is, you know, maybe work with cattle for ten or fifteen years. You know, they’re large animals and they’re the most similar to your giraffes and your rhinos, and I just thought, “Oh, I can’t work with cows for 10 or 15 years, I can’t do it!” So, I gave up on the zoo vet plan and I’m a small-animal veterinarian but I do as much wildlife and bird work as I can. I really love that. Yeah, not what you want to be chatting about at parties with cocktail in hand. Yeah, I mean it’s really physically demanding, and again, I imagine it would be same there, it’s a large area, there’s large distances to drive between farms, and being on call weighs you down. I mean, I was on call as a younger vet but I’m not now because I can’t do the thing where you work all day and then you stay up all night with, you know, a whelping dog or a snake bite or a tick paralysis case, and then you’ve still got enough brain power left to still be there at work and work your next day. I couldn’t do it these days. You mentioned one of your hobbies, archery, and you also have quite a bit of karate training. Have you used that in your in your fiction, your kind of insight into martial arts and archery? Absolutely. I always try and work out how things would actually work. I mean, it’s been a long time since I did karate. To get those marks, to get into vet, something had to give, so I gave up martial arts at that stage. 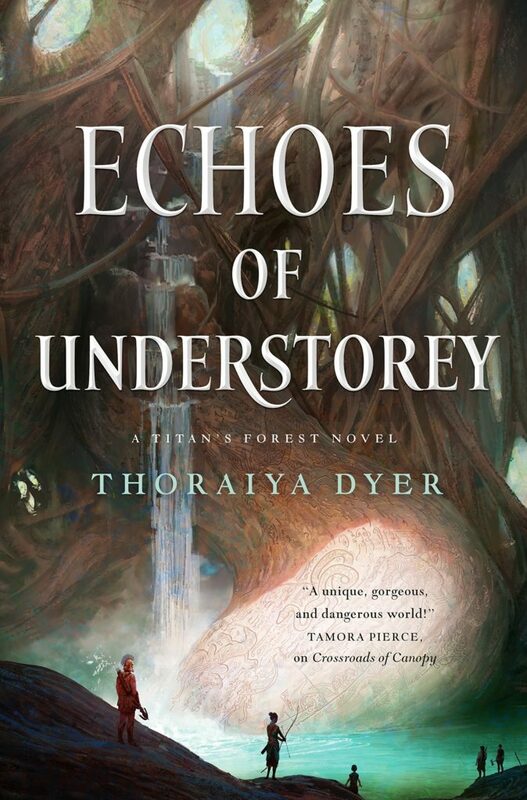 But, more for Echoes of Understory. 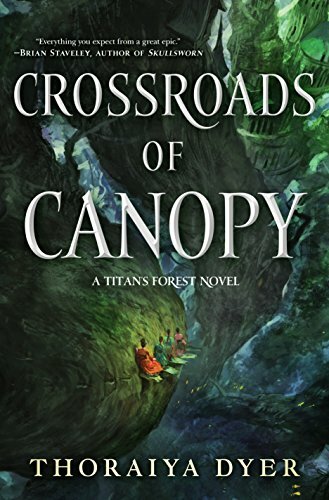 In Crossroads of Canopy, the main character is using magic, whereas the protagonist of the second book is a physical fighter. So, I was more using my karate and the archery knowledge in the second book than in the first. Have you felt, reading fantasy over the years, that archery is often badly done? I have had that thought. But then, when I mention it, seeing how little it matters to most people makes me wonder if I’ve been overthinking it and sort of over-researching. You know, it goes in with the theme of finding out cool stuff and then filling your stories with so much cool stuff that you haven’t got room left for your character to breathe and develop. It can be a bit of a bad habit. So, maybe I need to just throw all my practical knowledge to the winds and have all kinds of crazy stunts like the ones in the recent Robin Hood movie, which gave me a giggle of enjoyment, but was not any kind of historical accuracy. Well, as far as I can tell, fighting would be a lot easier if you could do it in slow motion. That’s what I get out of most of those. Goes for quantum physics, as well. That’s right. So, let’s talk a little bit about that. What was the seed for that setting? What made you think, you know, “I’d like to write a book set in a giant forest world–oh, actually, sorry, before we do that, maybe you should explain what the story is about. Well, so, this story is about a giant rainforest, so massive and…should I be saying this in kilometers or miles? Let’s say miles high…and stratified, so that the divisions between countries are vertical, not horizontal. Our characters are in the uppermost level of this massive, massive rainforest, they’re in this city up there that’s got its pantheon of gods that are reincarnated into human bodies, and our main character, Unar, she’s up there. Nobody up there knows what’s going on in the lower levels of the forest. It’s all dark down there, you can’t see what’s there, and nobody can come up from beneath because we’ve got this magical barrier, which is maintained by the gods, that’s separating them, so that no demons can come up from underneath. And then, of course, Unar’s sister falls down through this barrier, and that is the kickoff for her adventures to sort of find out what’s happening down there. So, what was the seed, so to speak, that sprouted this giant forest world? Well, it was wanting to have countries that were stacked on top of each other instead of side by side. And then, yes, because I spend so much time in nature then looking at this and realizing that in a real diverse and wild rainforest there are species that will stay, you know, between this high and this high off the ground, and that’s where they live, so wanting to have a fantasy map divided up like that, which I hadn’t really seen before, got me really excited about doing that. And then, the characters. You know, I’d just gotten my old book of Greek myths out to read to my daughter and there’s Atalanta, whose story is that she was raised by a bear, and then these three hunters who are brothers kill the bear and take over the raising of her so she has all these mad hunting skills. That was the story I was reading, and she is the basis for the character of Imeris, who is the protagonist of Echoes of Understory. But as I was working out the world and what kind of society it would be for a character like this to be born into, and going further back in time, that’s where the character of Unar came in. And then, the third seed, I guess, for the character of Unar was just reading so many fantasy books where the flawed hero is allowed to find redemption, whereas you don’t get to have a flawed heroine who is redeemed in the same way, she is either the villain or, you know, she’s condemned. And maybe I underestimated how much unlikability the reader would tolerate in a female character, because I’ve had quite a bit of pushback against her. But she is that way deliberately. It’s not an accident. And I like her, and how her story turned out. What’s your process for developing something? You have these ideas, do you do a detailed synopsis, do you work more with a more general idea and then you discover it as you write it? What’s the process for developing a story? I used to be a total pantser. But agents, as you know, prefer to have outlines, and so my process was to just write things on sticky notes. If you look back, you’ll just find, you know, one of them says, “Atalanta!” and another one says, “Countries on top of each other!”, all arranged in this hodge-podgy diagram in an exercise book. And then, after the idea collection, yeah, I did have to write an outline, and I wrote an outline for just the one book. And then when my agent suggested that Unar was not very likable, instead of changing her to be likeable I said, “Look, I’ll do a sequel with a more heroic kind of hero. And that was okay, and that’s how it got extended out into a trilogy. The three books…as you said, you have a different focus in the second one…so would you call them a series, or are they more like individual books, but they’re all related within the same world? I feel like you could read the second and third ones as stand-alones. But definitely, if you’re not a seasoned fantasy reader, things are more simplified and better explained in the first one, so you might want to start there. It’s three different protagonists and I hope I’ve done a good enough job explaining the backstory so that, yeah, you don’t need to read them together and I don’t think that they…I mean, in one sense there is a big plot arc that starts in the beginning and finishes in the third book but not as strong to be a true fantasy series, I think. So, when you were forced to write a synopsis, how long a synopsis was it? Was it extremely detailed or still fairly general? It was fairly general. It was about eight pages for each book, of single-spaced, twelve-point font, and I probably stuck to about two-thirds of what I had written. I don’t know. How closely do you follow your…do you stay pretty close to what you’ve written, or do you change it up? Well, it is a question I ask most people I talk to and, you know, it varies from author to author. For me, it’s probably sort of like that. I have a fairly detailed synopsis and I’m selling the books on the basis of the synopsis, but when I actually start writing it I start to wander, and occasionally…I know with one book I got close to the end and I realized there was no way I could get to the ending that I had put into the synopsis, so I had to replot everything from there to the end. So yeah, I’m right in there with you. Yeah, I feel like as long as it’s better than what you had before it’s okay. And, what happens is that as you’re writing, you know, the brain starts working on a different level than when you were synopsizing and thinking…well, I should ask you. What do you find is different about the writing as opposed to the synopsizing? You tell me. Well, I think if you start with characters and then you feel out the world second after you’ve done the synopsis then you discover things about the world that fit better or that you could use more neatly to solve a problem. Whereas, if you start with the plot, then go the other way, then you might find that what you’ve written is not actually consistent with that character and then it’s the characters who make you go in a different direction because you didn’t think about them properly before when you were deciding what they were going to do. What do your character notes look like? Do you do a detailed character sketch ahead of time or…? Oh, yeah. I mean, I try not to change the color of their eyes mid-book and I might just put in a few pertinent facts from their history. You know, a bit about their childhood, because that’s so formative for everybody. And then, you know, you always want to know what they love and what they’re afraid of, and if they’ve got any irrational fears or goals in the other direction, but not more than a couple of pages. How do you decide what characters you need? And a lot of this, of course, happens on the fly. You don’t necessarily figure it out ahead of time. Some characters pop up while you’re writing. What does your actual writing process look like? Do you write longhand, do you write that a regular time, how does it work for you? So, yeah, if I’m on the school drop off and I see something or hear something and I’m like, “That’s got to be in my story!”, I’ve got a notebook that I carry around with me for jotting. And then, when I get home I have got a separate, very old computer that’s not connected to the Internet, in a separate place far away from all Internet-connected devices. And I sit at it and I have to stay there until I’ve done my thousand words for the day. Sometimes that goes quick and sometimes it literally takes all day to produce this pathetic amount of words. There’s another word for that. It’s called a typewriter. Well, I then, you know, I like to be able to back it up, so here, because it’s not connected to anything, I’m carrying my little drives back and forth to my Internet computer. But yeah, I joined Twitter shortly after my first short story was published, and it was fantastic for networking with other writers and especially sharing links to all the amazing short fiction that’s published free in online magazines. But, you know, the whole day would go by without any words being written if I didn’t lock myself away. Yes. Yes, I’m right with you on that one too. You mentioned the Australian science fiction writer community. Very supportive? Do you have, you know people that you network with there that you either use as beta readers or just, you can talk about writing with? I did find a lot of beta readers. When I joined it was in the lead up to AussieCon, I want to say Four? Australia was having WorldCon in Melbourne and everyone, all the small presses, were really excited about having the guests we were going to have and the opportunity to showcase excellent and often creepy work to the world. So, a lot of them were taking submissions and a lot of books were coming out and, so, just for opportunities to submit places and also just to, yeah, just to talk about what you loved. It was great. And still, you know, I feel like catching up with people once a year at the Australian National Convention is the bare minimum of what I would want to do to stay in touch with people that I met back then. And I venture down to Sydney once every couple of months, probably, to write. I find I work best if I’m not critiquing other people’s work. I think I’m at a place now where I just want to submit things and find…like, I know when it’s good and when it’s not good and I’ll just send it out until there’s an editor who agrees with me, so I’m not doing a lot of the whole workshopping thing. So, when I go to a writing group we’re not reading each other’s stuff and giving feedback, but we’re just doing sort of a similar thing to what I’m doing at home locked in my writing room, but we’re doing it in solidarity and just churning the words together in the same room. Something that Canadian science fiction writers sometimes get asked is, is there something that makes Canadian science fiction different from British science fiction or American science fiction or Australian science fiction. Do you think there’s something noticeably Australian about the work that comes out of Australia? It’s funny you ask, because I noticed growing up, like I said, my grandparents were in Canada and they, you know, always wanting to support local artists, they would send me Charles de Lint and Guy Kay books. I always found them to have more…not Australianess, I don’t know, I just really enjoyed something about the writing itself—not the storylines, because they were the same, but just the actual writing styles seemed more Australian to me. Maybe it was that if you write, if you’re a Canadian writer, you feel like you need to explain your cultural references, because otherwise Americans won’t get them. And that definitely has to happen. If you’re setting a story in Australia and wanting to sell it overseas, you’ve got to explain things properly. Which adds a whole new level to your worldbuilding, because not only are you trying to not info dump too hard with the actual advanced science or fantasy magical thing that you’re trying to explain but then you’ve just got to also, on top of that, explain all things that are normal to you that might not be known to that reader. I don’t think there is much of a difference. Often people asked those sorts of questions on panels will say, “Oh, you know, we’re isolated in this big wide land and it lends itself to horror,” and Australians certainly write amazing horror with a sense of isolation, but I personally don’t feel that sense of isolation and I love the Australian wilderness and hopefully no one reading my descriptions of a forest are going to feel that it’s coming from a place of being threatened by the wild and the woods, ‘cause that’s beautiful to me, not threatening. That’s actually something that’s been said about Canadian fiction, that it’s man against nature and the vast unfeeling cold, and all that sort of thing. It’s so such a white person thing, isn’t it? It’s like, we’re here and there’s nothing and it’s empty, and like, no, it’s really not empty, it’s full of indigenous people and, yeah. I guess I haven’t read a lot of indigenous Canadian authors but that is my favorite Australian writing that’s coming at the moment, it’s indigenous writers coming into science fiction and fantasy and bringing their absolute connection, and that sense of wonder and. power that it has. It’s good stuff. Now when you’ve got your completed draft, what does your rewriting process look like? Do you tend to have a really clean manuscript, you don’t have to do much, or do you have a complete rewrite, or how does it work for you? I shouldn’t have so many. I mean, it’s pretty tidy. I don’t have many spelling mistakes, but I have to draw back and try and look at the big plot elements and make sure that they’re working. So, I’ll usually run off the whole manuscript, go and write short stories for a month, come back to it and write onto the printed manuscript anything that strikes me as I’m reading through it again. After that it’s good to go. So, you find it’s easier to spot stuff off of a printout as opposed to working just off the screen? Yeah, I don’t know if it’s the screen or again just being away from the Internet. I can take it to a quiet place. I should say, I do a lot of writing in coffee shops. And I can do it with just conversation going on around me. But if somebody sits too close and I can hear every word that they say, then I’ll put on headphones, because I don’t want to know about…whatever. And I’ve learned a lot about people sitting at coffee shops that I really don’t care about, so… But I’m not somebody that sets a playlist and, you know, you have mood music for writing battle seasons and you have different music for writing love scenes. I’ve talked to people like that but it’s not the way I work. That is strange and mysterious to me. It’s good that we’re all different. What’s the editorial process like? Have you had the same editor on all of the books at Tor? Do you get a lot of editorial notes from Diana? What’s her style? Yes. What I am not very good at, which she’s very good it, because she also edits YA, is really digging in the talons at the emotional high and low points and giving all the feels. Maybe this is an Australian thing, too, that we like it to be a little bit understated rather than spelling things out. And then, the other major fail is that I am not interested enough in fashion to describe people’s clothes properly. So, you know, there’s a lot of, “What are they wearing?” going on. So, yeah, sometimes…but she’s right. Yes. She’s right. It’s easy to do it it’s when you know that they’re right. I met Diana at Worldcon in San Jose, and she’s the one that put me in touch with you, because I’d asked her, well, actually, after I met her, she sent me an e-mail and followed up with me and then I said, “Well, you know, I’m looking for guests for the podcast,’ and so you were one of the people that she recommended to me, so I’m very happy that she did that. She’s awesome. And I’m jealous. One day I will meet all of the people. The New York people, I shall meet them. Agents, editors. Some day. I’ve met a few, but you know, living in Saskatchewan I don’t make connections with them very often either. So, you had the first book and how did it turn into a trilogy? You said, that the second one you wanted a more traditionally heroic character. How did you know that you had more story to tell, I guess is what I’m asking. Well, because I still had this other character hanging around, so I had my magician in book one and I had my warrior in book two, and then I had this third character and he’s a bit of a poet, a bit of a spy bit of a…he didn’t really fit in anywhere. And then I thought, “Oh, he’s my Odysseus character.” And that just totally fit with everything that had come before, so ghe had to have his own book as well. He had to o on his voyage of discovery and then I had my three parts of a rainforest, my canopy, my understory, and my forest floor. You’ve written some short fiction set in this world, too, haven’t you? Yes. So, one of the comments that even my agent made on the first draft of the first manuscript was that my antagonist didn’t seem to have enough reasons behind her evilness. My baddie didn’t have enough behind her. He wasn’t feeling it. So, I wrote her backstory, which then turned into a story in its own right. And it was a very kindly picked up by Podcastle, and they just did a fantastic reading of it. I’m trying to think of the voice actress’s name. Again, lack of research on my part, but no, I was really pleased with how that came out. Have the books been done as audiobooks? Yes. And I think I can remember that it’s Christine Marshall that’s the voice of the audio versions of the novels. Though it’s very strange hearing your thoughts come out in American accent, it’s very good also. I have a five-book YA fantasy series that’s actually set in Saskatchewan (so there was one where I didn’t have to explain any cultural references because it’s published by a Saskatchewan publisher and it’s set in Saskatchewan) but it recently came out in audiobook. I find it an interesting experience hearing my words read to me by somebody else. Do you find yourself listening to that and thinking, “You know, I kind of wish I had changed that…”? With short stories I will sometimes read the whole story out loud to myself because it really does let you find where you’ve repeated yourself or you’ve got unnecessary distancing or it’s just extra words that don’t really need to be there. But I confess to not doing that with the novels, so, yeah, it does make you think, oh, I could have tightened that up a little bit. But, you know, you can only strive for perfection. Well, with the ones that I had set in Saskatchewan I had to do a little pronunciation guide for places like Moose Jaw, and like, Wascana Lake, which is where the action takes place, and things like that. And Saskatchewan. I think I had to make it clear how Saskatchewan was pronounced. Yeah, well, people often want to know how to pronounce my name, but I think everything else, you know, say it how you want. It’s like how Jo Rowling pronounces Voldemort. All of us in the mainstream, saying how we’ve seen it on the movies, pronouncing the hard T, whereas she says it “Voldemore” because in her head it’s from the French and that’s how it should be said. I think it’s totally fine for authors and readers to be saying things a different way. I like to ask big philosophical questions here. You’ve written quite a lot at this point. Why do you write? Why do you think any of us write, and specifically, why do you think we write this kind of stuff? Or why do you write this kind of stuff? I think we write this stuff, I think we write this genre, because we have ideas for the future. We can see a way of things that’s different to how it is. I went to a book launch of a well-known Australian politician who had put out a book of his writing life. It was just a list of all these big important books, you know, “I’ve read War and Peace, and I’ve read this about the Holocaust and I’ve read that about this war, and it was all very heavy and realist. And if he had read any fiction, that was very literary and very, you know, stuff that was being taught in universities, and he hadn’t read a single science fiction or fantasy book, according to this tome, his whole life. And it just made me sad, because if our politicians aren’t thinking about, you know, “We don’t have to do things the same way we’ve always done,” how can we break out of these tragic cycles that have haunted Western civilization forever? The first step on making things better is being able to imagine, and I just think science fiction is able to contain all these ideas and help us extrapolate, and fantasy is giving us that sense of control, too. This is the way that this thing happened, but what if it didn’t? What if it happened that way instead? And that’s also so imaginative and so important. So, I personally am putting things in my books that I want to read and can’t find. The Australian content, I probably was a bit ignorant when I started and not looking close enough to find stuff like the indigenous content that I mentioned. Authors like Alexis Wright, who is a genius and writes Australian content better than I ever could, have now swum into my ken and these days I find it’s Lebanese content that I can’t find, my father being from Lebanon, and there’s a lot of short fiction out there, really excellent short fiction, Sofia Samatar and Sara Saab, incorporating Arab mythology into their stories. The one really great recent novel, which is the one by Saladin Ahmed, was gonna be the first of a trilogy, but he’s gone off into comics now. So that sort of less literary, Arabic-y fantasy is what I would like to do next. Well, that leads nicely to one of the upcoming questions, which will be, “What are you doing next?”. But I’m not there yet. 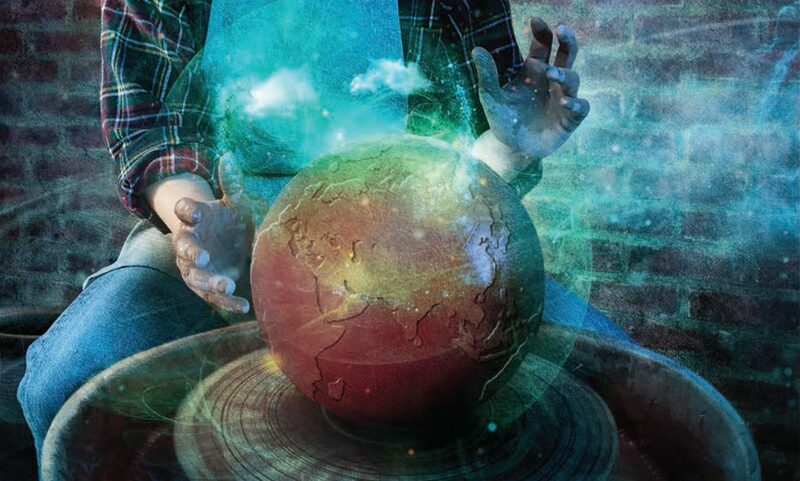 The name of this podcast is The Worldshapersand, you’ve kind of said this a little bit in what you just said, but, when you are writing you’re shaping a fictional world, but are you hoping in some way that you’re shaping the real world or at least changing your readers in some way? I think that might have been true before online became the main way we had of sharing culture. I think a book can’t have the influence now that it maybe could have had back when Kim Stanley Robinson was writing Red Mars. I’m glad he’s still doing it. But I think maybe films are more where it’s at as far as changing public opinion. It’s interesting, thinking of the impact of art forms, that there was a time when people would riot over paintings or, you know, poems or pieces of classical music. Those things are still being presented and they’re still vital art forms but somehow they are no longer the central art form that impacts people’s thinking. And I think you’re right. I think it’s gone to movies, or actually, probably even more television series these yeah. Which is too bad, as a writer. I mean, I say that…I just re-watched Arrivallast night because it’s come on Netflix and that came from a short story. I love it so much and I am working on an all-female version of it in a fantasy Arabia setting and it’s so much fun. I’m having the time in my life. Yes. My dad used to tell me, instead of your standard Western fairy tales, I’d get a bit of the creepy story about you go into the woods and the unicorn is there. And whereas you might think, “Oh, isn’t that wonderful,” you know, he’s this lovely white magical being with a magical horn, in the Arabic stories that he would tell they were always trying to kill you by stabbing you through the heart with their horn. And you had to, like, dodge behind a tree and trap them when their horn went through the trunk of the tree and then you would cut off their head and take it back to you, and I’m like, “Okay…”. So, yes, the unicorns that you will find in this book are a bit more like those angry ones than, you know, the unicorn that you might find in a French fairy tale. Is there any expected publication date for that, or is it still too early to say? No. I would say, Tor get first dibs, but I haven’t heard anything back as yet. So, I’m just on my merry way writing it. We’ll see what happens. Looking in the future, would you like to write fulltime or would you always want to keep the veterinary side of things. You know, if everything went really well and you were able to support yourself writing full time, would that be your choice or do you’d like to…? I had a break from veterinary work. I’ve only gone back in the last little while because, so, I was doing the writing and the stay-at-home mom thing, and then one day I went to walk my daughter to the bus stop and she was like, “You don’t need to come, Mom.” And I was like, “Well, okay, looks like I can go back to my day job, then.” But being back in that space, I did really miss the animals. And also, it forces you to interact. I’m also new to this town, I’ve only been here for twelve months, and I think if I had just been writing alone in my non-Internet connected room I wouldn’t have met the people and sort of become more integrated in the community. So, I think I will probably keep doing it, as fun as it is too the live-at-home-in-your-pajamas life writing magical stories. Meeting actual people is good, too. It’s good. Yeah. Talking to humans. Well, I think that’s bringing us so close to the time here, so where can people find you online when you’re not offline writing? I can find my tragically behind and not recently updated Web site at thoraiyadyer.com, and I’m @ThoraiyaDyer on Twitter. And the three novels of Titan’s Forestare…? They are Crossroads of Canopy, Echoes of Understory, andTides of the Titans, which is coming out at the end of January. Which should be just after this airs, so good timing there. And thank you very much for being a guest on The Worldshapers. I really enjoyed talking to you. It has been a great chat that has gone flying by. And make sure you come to New Zealand WorldCon, which will be close to me and not too far away from you. I should. I actually…yeah, it’s a little ways…I actually set a scene, a large portion of one of my books, the aforementioned YA fantasy series,The Shards of Excaliburseries, I actually set a section in the mountains of New Zealand, there’s a book called Lake in the Cloudsand the lake in question is actually in New Zealand. It’s so beautiful. You must go there. You don’t want to know if you made any mistake. Exactly. All right, well, thank you very much for being on The Worldshapers!